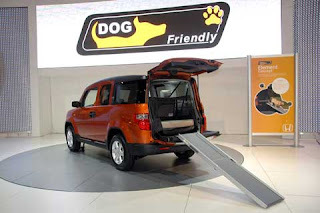 The new, dog-friendly Honda Element is almost here. It should be arriving at dealerships any day now and Fido can hardly wait! As you may recall, the 2010 pet-focused vehicle was introduced this Spring at the New York Auto Show. It's Dog Friendly™ Pet Accommodation Package only costs $995 and boasts an extendable ramp for easy entry, spill resistant bowl, cushioned pet bed, dedicated fan, rubber floor mats with a doggy bone pattern (this design can also be extended to the second row of passenger seats), and nylon webbing to keep Lassie safely confined in the back. For those who like to bring their dogs with them on trips, the new option is a little slice of Heaven. Ah, make that a little slice of Snausage.